What do you get when you put together two teams of Kyrgyz cowboys, a 250-pound headless calf, and a wildly cheering crowd? 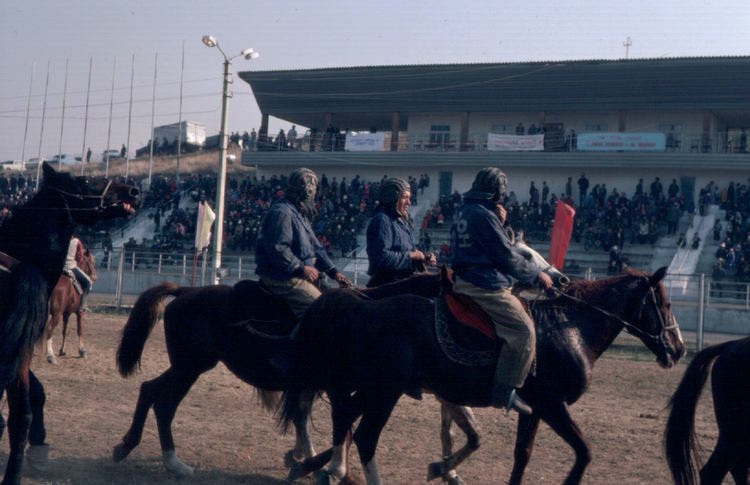 It’s the traditional horseback game of Ulak Tartyshy, popular throughout Central Asia. I’ll describe it as a cross between rugby and a no-holes-barred polo game, although I’m sure this description does not do it justice. In October 1996, Stephanie and I were in the crowd for what I guess was the Fergana Valley regional championships. Ulak Tartyshy was one of the highlights of the two-day Osh Harvest Festival, held at the hippodrome outside Kyrgyzstan’s second city. Like other harvest festivals, it marked the end of the season when herding families packed up their yurts and came down from the summer pastures in the mountains to their villages for the winter. The passing of the season was celebrated with traditional sports—wrestling, falconry, horse races, and horseback games. Even though Soviet bureaucrats preferred structured, mainstream sports in showpiece public arenas, they allowed the traditional games to go on, perhaps reckoning that they were a safer outlet for cultural expression than Islam. The herders dutifully claimed to be competing for the honor of their collective farm, but everyone knew that it was all about individual strength and horsemanship. In a game called Oodarysh, wrestlers on horseback tried to throw the opponent from his horse; there was a referee, who periodically separated human and horseflesh for infractions, but the rules were never entirely clear. In Kyz Kuumai, male and female riders chase each other around the track; if the man catches the woman, she has to kiss him; if the woman catches the man, she horse-whips him. There was no scoreboard but, as far as we could tell, there was more horse-whipping than kissing going on. In Ulak Tartyshy, two teams struggle for possession of an animal carcass, try to pick it up, and race with it toward the opposition’s line for a touchdown. In the minor-league version, a headless, legless sheep or goat is the ball, but this was the big league, so they used a 250-pound calf. Picking up 250 pounds is tough at the best of times, but when you’re on horseback with other riders jostling, punching, and whipping you, it’s a real challenge. For most of the game, all we could see was a tight knot of riders; they would reach down to try to pick up the calf and get pushed or kicked out of the way. One team, sporting what looked like Soviet World War II aviator headgear, clearly had the edge (with the help of some sideline coaching), and made two touchdowns. This dangerous game was played with true passion, with the crowd cheering each block, tackle, and fumble. The Kyrgyz are justly famous for their horsemanship, and we were happy we had made the long trip from Bishkek to see the traditional games.